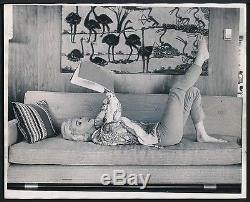 VERY RARE 1962 Original Photo MARILYN MONROE "Reading" by GEORGE BARRIS Marilyn's FINAL Photo Shoot - Just Before her Death. An IMPORTANT and Extremely RARE, Vintage 1962 ORIGINAL Photograph depicting Marilyn Monroe as captured by George Barris (1924 -). The New York City photographer who grew up in Manhattan's Lower East Side carries the distinction of being the last photographer to conduct an official photo shoot with Monroe, just a month before her death. Barris who shot for Parade & Cosmopolitan Magazine first met and photographed Marilyn in New York in 1954 where she was on location for the film, "The Seven Year Itch". The two became close friends. While collaborating on an upcoming book with Marilyn, Barris photographed Marilyn during a photo session that took place on July 13, 1962 in the Santa Monica Beach area in CA. Sadly, this would be Marilyn's FINAL photo shoot as she tragically died less than a month later on August 3rd, 1962. Barris is one of the last people still alive who knew Marilyn personally. This gelatin-silver photograph measuring 8" x 10" comes from the collection of the New York Daily News and was one subjected for use in newsprint publication at the time and has the paper's original press stamp and stamp dates, the earliest that reads JUL 13 1962, the exact date of the shoot! The photo is a period TYPE I photo made by Barris for the N. Daily News and more importantly a specimen made in 1962 and NOT a print made after her death (the last point is emphasized because there are lots of modern copies and later generation prints out there). This is an exceptional Marilyn photograph, one dating to her final photo shoot. This offered example represents one of only a few true original 1962 Barris photographs that will ever be publicly offered as the few known exemplars are buried in permanent collections and private galleries! "Please allow time for images to load". We are collectors, dealers, authenticators and conservationist of fine vintage photography and memorabilia for over 30 years and have handled some of the world's finest photographs. If you have never bought from us, please give us a try and join over 30,000+ customers. Your satisfaction is always guaranteed! We will NOT end auctions early. This is to give everyone a fair and equal chance to win. Check out my other items. Be sure to add me to your favorites list. The item "VERY RARE 1962 Original Photo MARILYN MONROE Reading by GEORGE BARRIS" is in sale since Thursday, August 04, 2016. This item is in the category "Entertainment Memorabilia\Movie Memorabilia\Other Movie Memorabilia". The seller is "hyee_auctions" and is located in Jersey City, New Jersey.